If you just want a cheesecake, leave out the eggnog, use 1 cup sour cream in its place, add 2 tbsp grated lemon peel and don’t brulee. A host of other toppings can be used instead, or just whipped cream! Combine the graham crumbs, butter, and sugar and press the mixture into the bottom of a 9-inch springform pan that has been sprayed lightly with nonstick spray. Bake the crust for 10 minutes, then set it aside. (Allowing your cream cheese to reach almost room temperature, will soften it) Beat the cream cheese in a large bowl with an electric mixer until smooth. Add the sugars, flour and extract and beat it again, just until it’s smooth. Add the eggs one at a time, beating well after each one. Beat in the eggnog and nutmeg and pour over the crust. Reduce the heat to 250°F and continue to bake for another 35-45 minutes. 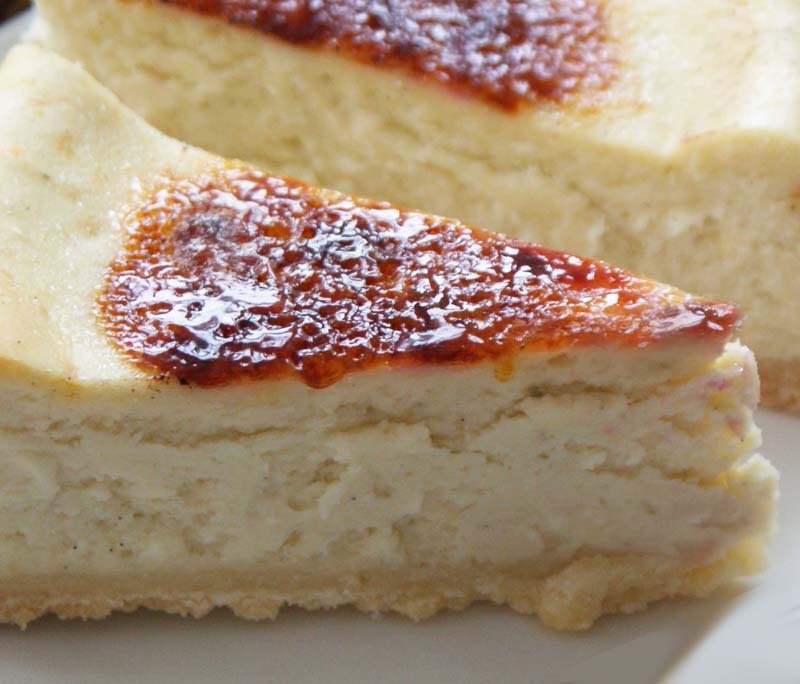 You can tell when the cheesecake is done when it’s barely firm around the edges and the center of the cake is firm to the touch. It will get a little more firm as it cools. Run a thin knife around the edge to loosen it from the pan, but allow it to cool completely. You should refrigerate it for at least an hour before you remove the sides of the springform pan. Sprinkle it with an even layer of sugar and run over the surface with a small blowtorch to melt it. Chill again until the sugar sets. Slice with a sharp knife dipped in hot water, then wipe dry before you slice again.